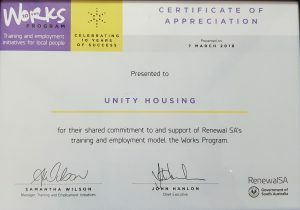 Unity has received a Certificate of Appreciation for our “shared commitment to and support of Renewal SA’s training and employment model, the Works Program”. 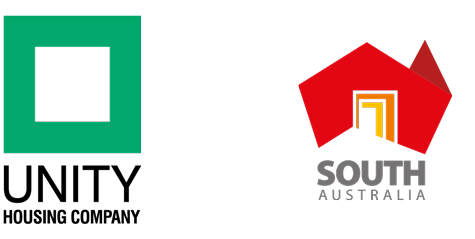 Now in its 10th year, the Works Program is celebrating a decade of partnerships and collaborations that have produced hundreds of training and employment programs across Renewal SA’s flagship urban renewal projects and has changed the lives of thousands. The program’s enduring success in producing these significant training and employment outcomes has been built upon its many successful relationships and collaborations across government and industry, including the partnership with Unity Housing.